This picture is not just of two amazing Boss Babes! It is a quick meeting with the VERY FIRST Gopher It client! Let’s walk down memory lane…. The year is 2016. Josh and Jenn Hayward and their three kids are living life to the fullest, or at least playing a lot of candy crush! Then one day some changes came quick and fast! Firstly, funding was cut for Jenn’s work and she was laid off. They regrouped and said “well that is okay, we got this! New adventures await!” Then one week later they got news that the same thing had happened to Josh. Less enthusiastic at both being laid off. “Hey, um, so adventure eh?” was their more tepid response. One week after this life altering series of events, Jenn is eating lunch with her good friend Angela. They have decided they need to hustle and start a business, but which direction to go? Both Josh and Jenn begin to miss home, Saskatchewan. Ottawa just seemed so big at that point; back home you could drive anywhere within 10 minutes, support local and be back home with little rush hour traffic. Then a light came on and Angela said “bring a bit of Saskatchewan to Ottawa”! We would all love to support local here in Ottawa, but getting around can be problematic for many. Hmm, a good idea, ok let’s think on it! Angela went home for a nap and woke up 3 hours later to see Jenn had already started the business. With one phone call to a local merchant and friend, Jenn started up Gopher It Deliveries. She called Darpan Ahluwalia from Manotick Natural Market and asked if she could use a delivery service to help get her products to people all over Ottawa. Darpan said yes and thus the business was born. While Gopher It Deliveries has clearly grown and services many different types of businesses, Jenn and Josh will always remember how it began, with local Boss Babes supporting each other’s ideas! Also acting fast, for building a business starts with one action, followed by another and on it goes. One might say Josh and Jenn just GoPher It! 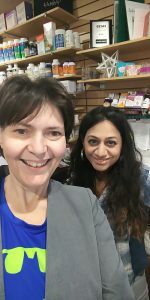 Thanks to Darpan and the staff at Manotick Natural Market, and we look forwarding to serving you and our other customers in the coming days, months and years. What a cool story – congrats on your 1 year anniversary! Pop lots of corks…you are definitely helping my business – Savvy Company!